Dominion, that's what you're trying to achieve. This time in the Renaissance! Mountain Village gets back a card from your discard pile instead of drawing you a card. Or draws you a card if it can't, you aren't hurt there. 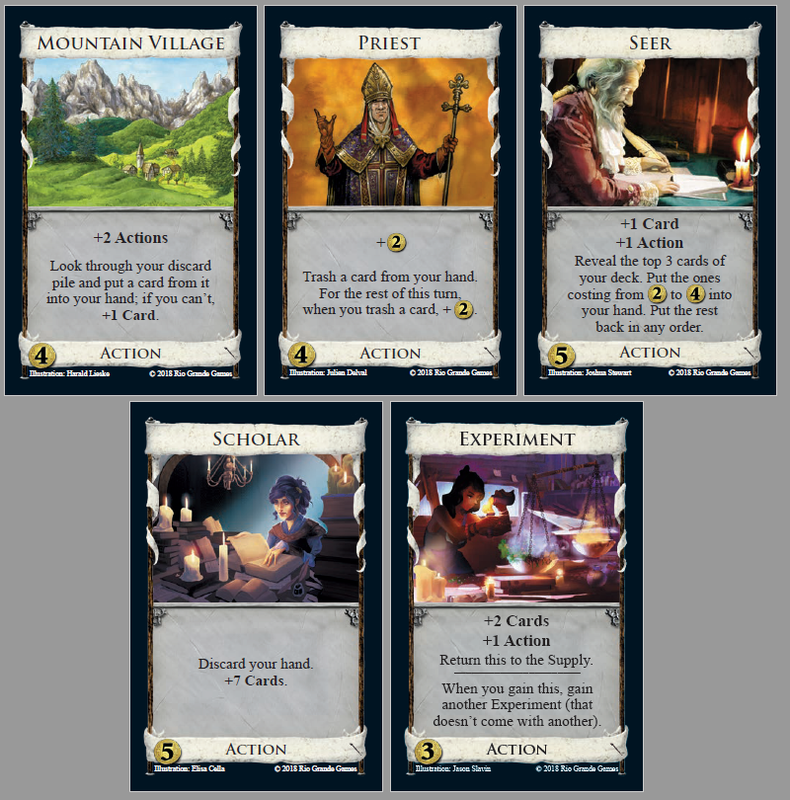 It does some tricks; the first one you'll see is, one Mountain Village in your hand gets back all the Mountain Villages in your discard pile. Priest is a trasher, and rewards you for further trashing. Play Priest, get +$2, trash a Copper. Play a second Priest, get +$2, trash a Copper, get a +$2 bonus from the first Priest. Play a third Priest, get +$2, trash a Silver (you ran out of Coppers), get +$2 from the first Priest and +$2 from the second Priest. See how it goes? Try to have enough stuff to feed them. Seer draws cards costing from $2 to $4. Those aren't your best cards but hey, you could get three of them. Scholar makes the cards go round. It's a poster child for simplicity; this set goes the extra mile to be simpler than the previous few. Experiment is a one-shot Lab, but you get two of them. Again, dominion.games, you can try out the cards right now (yes unless you are reading this from the future). Click on the thing that looks like it will do that, and it will. If we keep going at this rate, we'll see all the cards this week. Well we now know the action tokens are named Villagers. Half the kingdom cards don't use those themes? Wow this expansion is definitely gonna be more simple. And they seem quite interesting! Hm, those Lab variants seem not too interesting to me, but, Mountain Village, Priest, Scholar are all rather exciting. Hm, that Lab variants seem not too interesting to me, but, Mountain Village, Priest, Scholar are all rather exciting. The choice of whether to play them or save them is kind of interesting, and newer players may overlook the fact that there's even a choice to make. Being able to line them all up with Mountain Village or even Scholar... I think there are possibilities within this set alone, and even more so if you're just trying to set up a specific combination. I note that Mountain Village's disjunctive instruction—do X, but if you can't, do Y—has the same effect as "put a card from it on your deck, then +1 card." I appreciate the choice to go with the easier-to-follow instruction rather than the more concise one, especially if this is supposed to be an expansion with less complexity. I really like where this is going. Looks like the name "Renaissance" wasn't chosen on accident. Experiments look like they'd contribute well to a mega-turn. Priest would have been exactly the same without the initial +$2, but with the other instructions swapped round, right? Not if it's your last card in hand. First impressions video is up! Featuring games with jmjjmj and markus. Exciting stuff! I love that the expansion symbol is a brush, although without looking closely it kind of just looks like a line. Seer should be a great companion to Encampments, Hamlets, and Patricians (though the deliberate placement of a $5 card is only possible if Seer picked up not more than one Patrician). It's funny how Experiment is just Expedition turned into a card and they share the first 4 letters. Just a simple observation: Seer could combo well with Bridge to be able to pull more-expensive cards into your hand. Would an Expert have an Expectation that Experiment and Expedition are Expendable but Expedite a deck-drawing Experience? My first game with Seer had Bridge Troll, allowing my Seers to pick up Seers. These cards seem really powerful at first glance. Priest and fortress is gonna get ridiculous no doubt. Could end up being a crazy payload card. I'm assuming you don't get the $2 for the card that it trashes though. That would be +$4 trash a card from your hand. Either way I'll probably be opening priest a ton. It trashes (just one card but still) and will also help you hit $5 on the first shuffle. Mountain village sounds really good, but now that I think of it the presence of cursers will make it weaker because you'll probably have to put a curse in your hand if it's all that's in your discard pile. I do love the simplicity and can't wait to play with them! A guaranteed triple Lab via Seer after a 5/2 opening looks game-breaking crazy. If there is a junker at $5 you want Seer even more and if there is a trasher at $5 chances are extremly high that you can get it after the first shuffle. I'm really confused by your comment...Seer only gets cards costing from 2-4. How is it a guaranteed triple-lab, since it can only draw your opening buy and estates? How does it help you hit 5? I don't care much for the hyper-simplicity but Mountain Village seems the most interesting so far. Definitely behaves uniquely, Can be totally crazy, can just draw junk from the discard so anti-synergies with junking and sifting. Still not particularly skill-dependent unless it competes with other splitters in the Kingdom.